Azade Suites front desk would be happy to plan the best alternatives for you during your stay in our historic city. 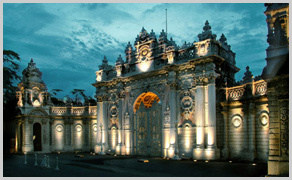 Just tell us a little about yourself and we will help you to get most from your Istanbul visit. We would be more than happy to answer all of your questions and offer you helpful suggestions to eat, see, and enjoy all during your stay in our breathtaking city. The Topkapı Palace which has been the center of the state administration for nearly four centuries of the Ottoman Empire, is preparing to host the masterpieces of the Kremlin Palace. The exhibition that is named "Kremlin Palace Treasures are in the Topkapı Palace" is inviting all residents of Istanbul to be witnesses of the great meeting of the two palaces. Topkapı Palace Museum is closed on tuesdays. The ancient Byzantine church, built by Justinian I between 532-537 AD after the Nika Riot, was later converted to a mosque with the addition of minarets in mid-15th century. The remarkable structure with its 56m high immense dome is a museum today in which you can see both Christian and Islamic art. There are good examples of the Byzantine mosaics as well. 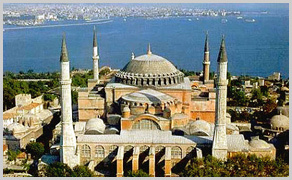 For about 1000 years this was the largest church in the world, and glory of the Byzantine Empire. This 17th century mosque, near Haghia Sophia, is famous for the beautiful blue tile work ornamenting its walls. 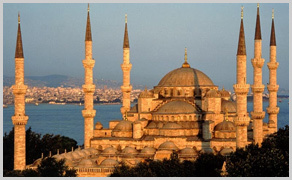 Its surrounding six slim minarets distinguish it from other mosques which normally have two or four minarets. It was built by architect Mehmet Aga by the order of Sultan Ahmed I as a complex in seven years and became the most important mosque of the city, right in Sultanahmet square. As it enters a new millennium humankind is undergoing a process of radical change. We are all witnesses to this transformation as humankind sets out the markers for a new civilization. In the northern hemisphere the industrial age is almost over. Knowledge, and thus humankind, is embarking on a new era in history. It seems that the new millennium will be more 'ethical'. The Grand Bazaar (Turkish: Kapalıçarsı, meaning Covered Bazaar) in Istanbul is one of the largest and oldest covered markets in the world, with more than 58 covered streets and over 1,200 shops which attract between 250,000 and 400,000 visitors daily. 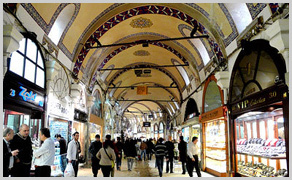 Opened in 1461, it is well known for its jewelry, pottery, spice, and carpet shops. Many of the stalls in the bazaar are grouped by the type of goods, with special areas for leather coats, gold jewelry and the like. The bazaar contains two bedestens (domed masonry structures built for storage and safe keeping), the first of which was constructed between 1455 and 1461 by the order of Sultan Mehmed the Conqueror. The bazaar was vastly enlarged in the 16th century, during the reign of Sultan Suleiman the Magnificent, and in 1894 underwent a major restoration following an earthquake. There are several documents suggesting the name of the bazaar was first "New Bazaar". However, due to the fact that many spices were imported via Egypt in the Ottoman period, the name "Mısır Çarsısı" was favoured by the public. The word mısır has a double meaning in Turkish: "Egypt" and "maize". This is why sometimes the name is wrongly translated as "Corn Bazaar". The bazaar was (and still is) the center for spice trade in Istanbul. The building itself is part of the külliye of Yeni Mosque, and rents from the shops within was intended to help pay for the upkeep of the mosque. 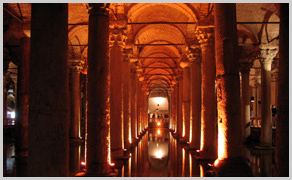 The structure was designed by the chief court architect Koca Kasım Aga, but completed by architect Mustafa in 1660. The Spice Market is open daily between 09:00-19.00 except on Sundays and during public or religious holidays. The Galatasaray Square is almost at the halfway of the Avenue and houses one of the finest educational institutions established in Turkey during the Ottoman Empire; formerly Mekteb-i Sultani (School of Sultans), today Galatasaray Lisesi (high school).Across Galatasaray Square there are some significant historic buildings such as the Cicek Pasaji (The Flower Courtyard) with many small restaurants and taverns, and Balik Pazari (Fish Market) where you can find some fresh fish and vegetables.On the same street and on its side streets there are also Catholic churches such as St. Antoine and Santa Maria, Armenian Churches, Synagogues, old mosques, Pera Palace Hotel built in 1892 by George Nagelmackers, academic and cultural institutions established by various European nations such as Germany, Italy, Austria, and France in the early 19th century, consulates of several nations including Germany, France, Greece, Sweden, Armenia, Russia, Netherlands, Spain, Sweden, and United Kingdom, amongst which the British and German consulates being the most impressive buildings in the area. .
To the end of this pedestrian street towards Galata, there is Tunnel, the world's second-oldest subway, connecting Pera district with Karakoy district on the Golden Horn. Next to this you can also see Divan Literature Museum which is called as Galata Mevlevihane belonging to Mevlevi order founded by Mevlana, where Whirling Dervish ceremonies are performed twice a month.Old Galata and Pera districts were inhabited since the Byzantine Empire. During the 19th century Ottoman Empire, the street was known as Grande Rue de Pera and the district became a center for foreigners, Levantines, Ottoman intellectuals and western culture admirers. 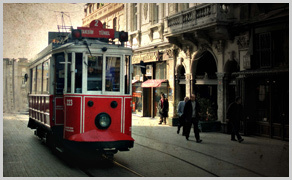 After 1923 the street's name was changed to Istiklal (Independence in Turkish) to commemorate the War of Independence led by Ataturk. 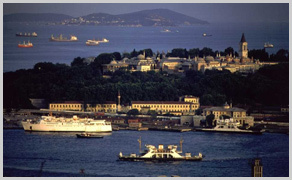 The Princes' Islands are composed of nine islands off the Asian coast of Istanbul, in the Sea of Marmara. There are regular passenger ferries and fast passenger ferries (sea bus) to the four of the islands from different piers of the city; from Sirkeci, from Kabatas, and from Bostanci districts. 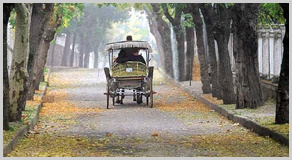 Motor vehicles are not permitted on the islands except the ones belonging to local municipality for public works, so people walk or rent a bicycle or horsedrawn carriage, even a donkey. These are nice little islands where local people have their summer homes or go there for small beaches and for picnicking, or just to wonder around at the weekends. These four islands are known as Adalar (Islands) in general in Turkish and their names are Buyukada, Heybeliada, Burgazada, and Kinaliada. There is also Sedefadasi which is not very popular as the other ones and very small settlement on it. There are no settlements on Hayirsizada, Sivriada and Yassiada, and Kasikada is a private island. Yassiada holds a tragic moment in our recent history because one of our ex-premiers, Adnan Menderes, was sentenced to death penalty and he spent his last days of life in a prison on the island. The name of the islands come from the Byzantine period, when princes and empresses were exiled there. But during the Ottoman period, especially around 19th century with the use of steamboats, these islands became a popular resorts for Istanbul's rich people, building their wooden houses. Jewish, Greek and Armenian communities were a large part of the inhabitants of the islands. Today, the islands are popular tourist destinations for daily excursions especially during summer months. There are many monasteries and historic buildings on the islands, besides Victorian style old wooden mansions.